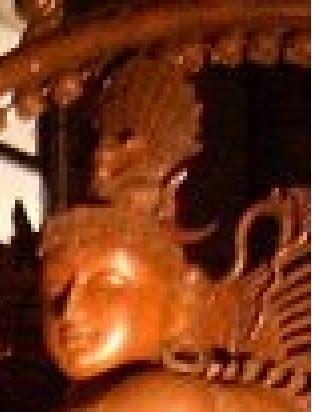 THIS IS SHIVA = Shiva is a major Hindu deity and is "the Destroyer" or "the Transformer" among the Trimurti, NICE HAT!! We celebrate and honor Cernunnos as the Green Man in spring and summer, the light half of the year, and as the Dark One or the Dark God in autumn and winter, the dark half of the year. He appears in spring as the young Son, child of the Goddess, embodiment of the budding, growing, greening world. In summer He is the Green Man, vibrant, pulsing with life essence, the consort of the Green Lady Goddess. But, it is in autumn, the dying time, that perhaps we see the Horned God most clearly. He is the sacrificed one, who, wounded unto death begins his journey to the Underworld, returning to the Earth from which he was born and where the seeds of light released from his decaying body will quicken Her womb with a new Son/Sun once again. 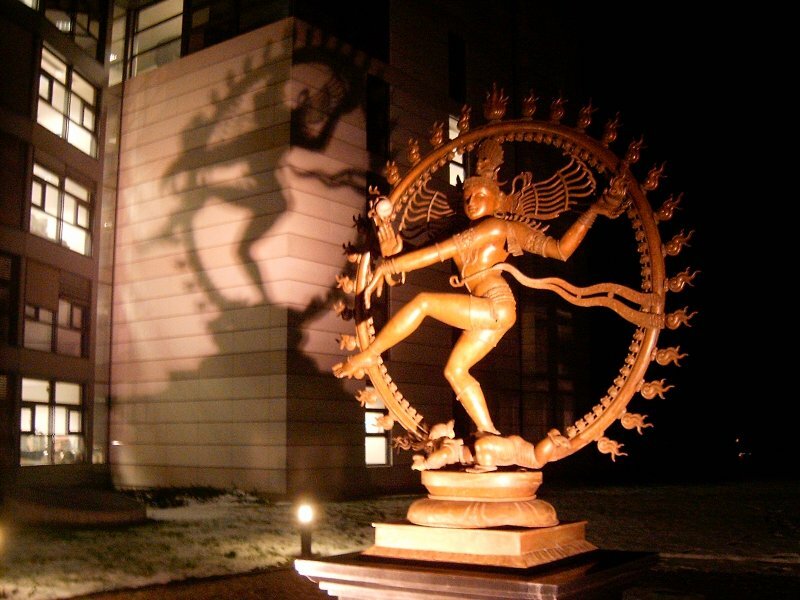 THIS NEXT PICTURE IS THE SHIVA STATUE OUTSIDE CERN. SOME PEOPLE OUT THERE SAY CERN ARE TRYING TO BRING BACK THAT DEMON GUY CERNUNNOS WITH THEIR EXPERIMENTS. THEY HAVE CONNECTED THE TWO TOGETHER BECAUSE SHIVA STANDS FOR DEATH, REBIRTH AND REINCARNATION ALSO THE NAMES ARE ALIKE 'CERNunnos' GET IT? THE CONSPIRACY FOLK THESE DAYS WILL FIND ANY LITTLE THING AND MAKE A BIG DEAL OF IT. I MEAN CERNunnos COME ON THAT'S STUPID. THAT' A NICE STATUE AND A VERY CLOSE LIKENESS TO SHIVA. THE ONLY THING I WOULD CHANGE IS THE HAT. I LIKED THE HAT ON THE ORIGINAL STATUE BUT THEY HAVE CHANGED IT. YOU CANT REALLY TELL FROM DOWN HERE SO LETS TAKE A CLOSER LOOK! I DON'T LIKE THE HAT BECAUSE IT LOOK LIKE A HEAD. A HEAD OF SOMEONE I DON'T LIKE. OH WAIT IT LOOKS LIKE THAT DEMON GOD GUY CERNUNNOS . OK NOW I'M FEELING A LITTLE WEIRD ABOUT THIS WHOLE THING AND THOSE CONSPIRACY GUYS DON'T SEEM SO STUPID ANYMORE. OK SO LETS SAY IT'S TRUE. WE BELIEVE THE EXPERIMENTS THERE ARE IN SEARCH OF THE GOD PARTICLE BUT ARE THEY IN FACT CREATING A GOD PORTAL? SOUNDS FAR FETCHED BUT AT THIS POINT I'M IN NO POSITION TO SAY ANYTHING ELSE IS STUPID. IF THEY WANTED TO RETURN THIS GOD TO EARTH THROUGH A PORTAL WHEN WOULD THEY DO IT? WOULDN'T THEY HAVE DONE IT ALREADY? WAIT A MINUTE REMEMBER THIS>>> " returning to the Earth from which he was born and where the seeds of light released from his decaying body will quicken Her womb with a new Son/Sun once again." AND WHEN DOES THIS HAPPEN? "the Dark God in autumn and winter, the dark half of the year." SO IF THEY WERE PLANNING TO DO THIS, THE BEST TIME WOULD BE WINTER IN THE DARK HALF OF THE YEAR. LET'S TAKE A LOOK AT WHAT'S GOING ON AT CERN DURING THE WINTER. The test set for the week of December 17-21, 2012 is the final test before the LHC will shutdown operations for upgrades and will resume operation in 2014, assuming something doesn’t go wrong, in the minds of some of the scientists, terribly right, which causes the end of the world. I guess we will just have to see what happens. Let us know what you think, is CERN guilty of a self-fulfilling prophecy of destruction here? It has been written that some time in the 23rd century B.C., a king named Nimrod built a tower that was designed to be a stairway or gateway to heaven. According to traditional mythology, Nimrod wanted to meet God and understand his workings. His tower was literally a stairway to the stars, a way to enter the dimension that God inhabited. There are occultists and mythologists like William Henry that have claimed that the ancients like Nimrod and others used these towers and stargates. The towers created wormholes and the Gods from the stars would pass through them. But, of course, God didn’t like the idea and so he confused the language of Nimrod’s people. Undaunted, he organized the Stone Masons. They continued to build these stargates and temples. Throughout ancient history there have been many accounts of gods traveling from location to location using intricate machinery that would take them from one dimension to another. There are accounts of the ancient Sumer speaking about so-called gods coming in through a double pillared stargate and there have been carvings that have represented such a feat. It is amazing to think that the ancients had mastered the ability to travel using wormhole technology that we now are hearing about at places like the Large Hadron Collider at CERN. If we look back into he ancient histories we can point to the possibility that the Pillars of Osirus were quite literally fashioned as a way to somehow teleport the gods to their various dimensional abodes. According to mythologist William Henry, the Osiris Pillar or the Temporal Cross was called the Ta-Wer, meaning ‘bond between heaven and earth.’ It was a machine that was capable of opening dimensions or wormholes. These worm holes carried the Gods to other locales in the Universe and the same technologies were used to summon the gods. There are many tapestries that hang in ancient churches that depict the second coming of Christ. In these tapestries the heavenly hosts arrive in a whirlwind that opens up a dimensional doorway. The tapestries show Christ returning in what appears to be a dimensional wormhole or Stargate. There have been many attempts to open wormholes and at the same time the purpose of these magical workings was to somehow summon demons or angels to come and initiate the eschaton. There are plenty of Wizards who have claimed that they have opened a wormhole using magical methods. These are Methods that have allegedly brought dimensional beings into our existence. The idea of a dimensional push to open a doorway to beckon a god or an entity has been the challenge from Nimrod’s time, to the times of John Dee, Edward Kelly, Aleister Crowley, L. Ron Hubbard and a Jack Parsons. Between the years 1582 and 1589 the English scholar John Dee conducted a series of ritual communications with a set of disincarnate entities that eventually came to be known as the Enochian angels. It was Dee’s plan to use the complex system of magic communicated by the angels to advance the expansionist policies of his sovereign, Queen Elizabeth I. With the aid of fellow occult researcher Edward Kelley he planned to open a portal to the other side by using the lower keys of Enoch, a magical Alphabet that was sung. They were literally calling upon the spirits of the dead to do espionage for the queen according to history they were quite successful. These angels declared that the heavenly name for Satan was Choronzon and that there were at least 4 watchtowers or pillars where star gates exist on the earth. There is also a way to open portals elsewhere as long as certain keys and sigils are used to summon entities to perform an apocalyptic working or spell. One of the other rituals performed by John Dee was to summon the Archon gate keeper Cernunnos. To the Celts Cernunnos, Cerne or Belatucadros, and was depicted as a humanoid figure who was more commonly depicted as having horns. One of Cernunnos’ titles was Lord of the Hunt, but as time progressed agriculture could sustain alongside hunting and the Horned God became the god also of fertility. Worship of this deity was hoped to not only maintain plentiful meat, but also ensure a bountiful crop harvest and even the successful procreation of mankind. In such we find the concept of life, death and rebirth, in other myths Cernunnos is depicted as a horned God that controls the serpents. The serpents were symbolic of mortality, healing and the resurrection of the dead, or the use of the dead for divining or necromancy. As death is integral to the continuous circle of life, Cernunnos has also been associated to the Underworld, the realm of the dead. Whilst the invading Romans could associate the Horned God with some of their own belief concepts, such as the deity Pan or the horned spirits called Fauns and Satyrs, the developing Christian Church however could not comfortably assimilate this fertility icon into their own ethos and so Cernunnos was demonized. Thus the Horned God became associated with the devil or Satan. The invocations and the summoning of Archons were all part of something called “The Apocalypse working.” The concept was to summon various angels and later demons of the underworld to open a Stargate or stairway to the heavens. It was actually one the first attempts at opening a portal to another dimension and summoning spirits. It was literally a ritual to open up the secrets of the universe and converse with Gods. The angels never empowered Dee to be the instrument whereby the ritual formula for initiating the apocalypse would be accomplished. The Angels stated that the “working” would have to be accomplished in a later time. The unfinished ritual would sit like a ticking occult time bomb, waiting for some clever magician, perhaps guided by the angels, to complete it. Dee evidently never received the signal to conduct the Apocalypse Working in his lifetime. It was to be reserved for another century and another man. That man was Aleister Crowley. Crowley and his followers wanted to usher in a morality more severe than any other experienced in the world. In order to accomplish this they had to carry out powerful rituals. His methods were misunderstood and rumor has it that they were so abhorrent that Mussolini threw him out of Sicily calling him a “barbarian.” He promised that after his death there would be a final working or ritual where a portal would be opened and the “secret chiefs” or ancient Egyptian Gods would return. Many People believe that what came through were beings that looked like the Alien “grays.” L. Ron Hubbard went on to create Scientology, a religion that teaches that alien entities are responsible for using humans as avatars and that alien spirits get mankind to do evil. Jack Parsons became the founder of JPL and claimed that during the Babylon “working” “that both he and Hubbard were a part of widened the portal for Crowley’s Amalantrah working allowing the secret chiefs to enter in to help mankind. He later attempted another secret project, conjuring the Lower key of Solomon to usher in the Apocalypse. During the ritual, he accidentally blew up his lab while playing with powerful explosives. Some believed he was attempting to open a Stargate to summon the Goetic Demons.For the last 4,500 years or so we’ve been waiting for another shot at opening the Gate using scientific methods. We have been waiting for the right date and time for this to happen. According to Pat Holliday PHD this ritual of Stargate opening has continued to this day and according to research provided one of the main centers for performing these rituals is at the Large Hadron Collider at CERN. While CERN has been notorious for its finding of the Higgs Boson or God particle. It has also been feared to be the world’s foremost doomsday machine. One major accident at CERN and it is believed the world could end. This year, CERN is beginning another set of experiments in hopes to getting that much closer to completing their crusade of tome bending and portal opening. Scientists at CERN have announced test dates for the rest of the year, as well as some curious dates can be found in the upcoming schedule. Starting Monday, December 17, 2012 and going through Friday, December 21, 2012, CERN will be launching and running a series of collisions, which are predicted to break records in high voltage collisions already set by the Large Hadron Collider. With these experiments, the scientists are hoping to create atomic reactions that would provide further information about anti-matter, and the big bang. The test set for the December 21st, 2012 is the final test before the LHC will shut down operations for upgrades and will hopefully (if we are not all dead) resume operation in 2014. The machine that many believed would cause the end of the world will be conducting its most advanced tests on the same day that the world is predicted to end. Once again it has to be indicated that CERN is located in Geneva. Geneva and “Saint Geniis” are similar to the word “Genesis.” The purpose of CERN is to find the Origins of Man and the Universe. They have stated that they want to open a doorway to another dimension and find a God. Is it just a coincidence that CERN is short for the horned God Cernunnos? Is it also a coincidence that CERN has to go deep underground to do their “god” harnessing experiments? Cernunnos was the god of the underworld. CERN is linked to several secret projects being carried out by the European Union and the European Trilateral Commission. CERN also is responsible for the internet and have been doing ongoing research for governments with regard to global sustainability. It was also reported that in 1999 CERN proposed and carried out quantum Vortex experiments searching for Solar Axions. Axions are hypothetical particles that are components of dark matter. In order to find these Axions CERN proposed the use of a decommissioned magnet called SATAN. It was an acronym for Solar Axion Telescopic Antenna. One of the attempts at creating a portal anchor happened in an area where there is rumored to be an ancient Stargate in the real ancient Babylon, Iraq. On September 8th, 2008 something happened in the Iraqi city of Al Hilla. Al Hilla has been rumored to be a city where a Stargate exists. It was reported that there was a cover up where nearly 20 American troops died as they attempted to cross through a gate conduit between the Collider at CERN and one of the anchor gates at Al Hilla. According the mainstream news reports the soldiers committed mass suicide. However one of the peculiarities reported in Fars News agency was that Iraqi security sources reported that 21 US troops had committed suicide inside a former Iraqi air force base, the 21 troops were treated in a hospital but only five soldiers survived and wound up missing. Narcotics were allegedly used in the suicides. The servicemen belonged to a unit of the US Airborne Division. The question is how did so many soldiers have access to potent narcotics and what happened to the five survivors? A witness reported that the bodies of the US troops were hideously deformed and misshapen in such a way that they looked like 5000-year old mummies. On September 11th, 2008 it was reported that the collider officially went online on September 10th. with a test firing. The press reported that nothing significant happened and there was no danger and no end of the world However A strong earthquake measuring 6.1 in magnitude struck southern Iran. Then it was reported that Northern Chile was struck with a 6.0 tremor. Then a magnitude 6.9 earthquake rattled Japan and then within minutes of a magnitude 6.6 earthquakes hit Indonesia. The collider wasn’t even at full power. On December 8th, 2009 CERN’s collider was still not up to full power however thousands of physicists around the world cheered as they smashed together subatomic particles at the highest energies ever reached by a human-made accelerator and the giant ATLAS detector observed the products of the record-breaking reactions whizzing through its sophisticated tracking devices. Coincidentally a strange spiral appeared over Norway early before sunrise. The light looked like a portal spiraling into a black hole. The buzz about this spiral and it’s comparison to a wormhole opening up was viral on the internet and later it was discovered that a Communiqué linking HAARP CERN and The Norwegian array EISCAT was released making the wormhole explanation compelling. I will be the first to admit that this is not hard science or pseudo science, it the new normal for a planet that seems to be the battered partner and the response is the shaking, the sounds of underground creaking and pushing and many thunderous rumbles and explosions deep within the earth’s crust. A large ring encircles the area near CERN. It has the circumference of about 27 kilometers and inside it are 9300 magnets. Could this be displacing magma inside the earth? Someone needs to ask the question. The collider is a scientific machine that no one questions and yet it seems to be a monster that when lit has started creating these maga-quakes, tsunamis and disasters. During 2010 and 2011 the LHC increased the potency and number of quarks it collides in its experiments. What CERN does not tell us is that with this intensity come consequences. The attempts at finding the God particle over the years has resulted in greater quantities of atoms of strangelet liquid, called hyperons, made of up, down and strange quarks even when running at low energies, despite all their safety reports that said it would never produce them. We are told that they would evaporate or become inconsequential. Stranglets leaking into the earth’s core can and will create an increase of earthquake and volcanic activity. Many people have tried to interpret he word RAYPOZ as being the name of the antichrist. But, as you can see, CERN has used Saturn/Satan or Cernunnos as a ray-based positron source. The authorities at CERN have done their ritualistic experiments in the underworld and has used unlimited power to turn against the earth. This power has shown that it is causing an increase in earthquake activity and some even claim that it may be the reason for an increase of UFO activity as well. There has been an ongoing conspiratorial dialogue about what really is going on at CERN and what the purpose of this collider really is. Is it a high powered dimensional tool to create star gates to welcome entities into the world and could the attempts at going such a thing destroy the earth? The LHC at CERN is a particle booster, built to beam up protons in very high speed and opposite directions, until they collide creating a huge amount of energy capable to reproduce similar cosmic conditions that have creating such phenomena as dark matter, antimatter and ultimately the creation of the universe billions of years ago. It has also been rumored to be a device that can bend space time, open dimensional portals. Now anything is possible and anything the mind can conceive can appear in the material world as we bend the time line. Re: CERN GOD PORTAL EXPOSED!! NWO GRAND ALIGNMENT/CERN CONNECTION...MUST READ!! ok this is going to blow your mind folks!!! The Threshold is a state between death and life, that can be celestially symbolized as encompassed by the waning and waxing moons (The Lunar Double Door), and again, symbolically rendered as the dark watery womb of the Goddess, through whose labyrinthine womb (sometimes depicted as a double spiral) all shall pass to die and be reborn. It is here that the Threshold God resides, within the womb of the Lunar-Cosmic Mother, that conceals the gateway to the solar trans-cosmic realm, that is the ineffable source of the infinite forms of the universe, symbolized by Cernunnos animal entourage, as in the Hebrew myth of Noah’s animals on the ark, and again in the myth of Dionysus and the pirates, where animals materialize upon the ship transfixed upon the cosmic ocean, and ivy and grapevines miraculously sprout, and the etheral sound of music filled the air. In the Imperial House of Japan, there are three valuable treasures which were derived from ancient Japanese myths. These three are a sword, a jewel pendant and a mirror. Among them, the mirror called "Yata-no-kagami" (mirror of Yata) is placed in "Ise-jingu" which is the Shinto shrine for the Imperial House. In fact, there is a rumor that God's name is written in Hebrew on the back of this holy mirror. This mirror is regarded to be very holy and no one is permitted to see it usually. But there are some people who insist that they have seen it. In the Hindu religion, the hexagram is called the Shatkona, and is equivalent to the symbolism in ritual magic. The Shatkona is the combination of the Shiva kona (trikona, triangle), the symbol of the God Shiva, representing the element of fire, and the Shakti kona, representing the element of water. Together, they represent the union of male and female, and the heart chakra. The crest used on the inside of the shrine (Izawa-no-miya) at Ise-jingu is also the Star of David. This has existed since ancient times. In Kyoto pref., there is a shrine called "Manai-jinja" which was the original Ise-jingu Shrine. The crest of "Manai-jinja" is also the Star of David. So, this has been used since ancient times. In fact, the similarities of teh jewish to the japanese is even apparent in the Y chromosomes they share. However that is a different story all together, and if you wish to research it I encourage it. The purpose of this study, with chart for illustration is to highlight a key celestial occurrence in the Heavens called the Star of David planetary alignment. The focus of the timeline presented will be from the most recent occurrences in our modern time. Starting from 1990 to 2013, these peculiar planetary alignments seem to be clustered. In particular, since 1990, there are 13 Star of David configurations that occur. The 13th occurrence is the ‘last one’ leading up to the Tetrad of 2014-2015. After 2013, there will not be another such configuration of either a Tetrad or Star of David alignment for another 100 years or so. The Star of David alignments appears to follow a ‘countdown’ sequence or frequency of sorts. It very much appears to be like the Total Solar Eclipses that occurred consecutively on the 1st of Av in 2008, 2009 & 2010. Those 3 consecutive Eclipses appeared to signal the ‘countdown’ to the start of the 7-Year Solar-Lunar pattern. It appears that this same principle or ‘astronomical law’ is at work here with the Star of David alignment pattern & symmetry. The pattern likewise suggests a sort of a ‘cosmic countdown’ perhaps is highlighting the Tetrad of 2014-15. As to who or what event the countdown is specifically referring to, that will remain to be seen. Perhaps these Star of David ‘signs’ in the Heavens could it be a countdown to the Rapture, the New World Order, the rise of the AntiChrist, World War 3 or a combination of all the above & more. For the purposes of this study, only a better understanding of the Star of David’s numerology & patterns will be presented & considered. Nonetheless, students of Biblical Prophecy can tell you though, that Biblical Scripture is very clear as to what is coming specifically in the Last Days: the Rapture, sudden destruction, chaos, antichrist, war, disease, death, Return of Jesus Christ, etc. Perhaps all these events are already ‘written’ in the stars through such clues to be found in the Solar-Lunar Eclipses, comets & the Star of David planetary alignments. Many would agree. question is whats the connection and will the ritual involve CERN?